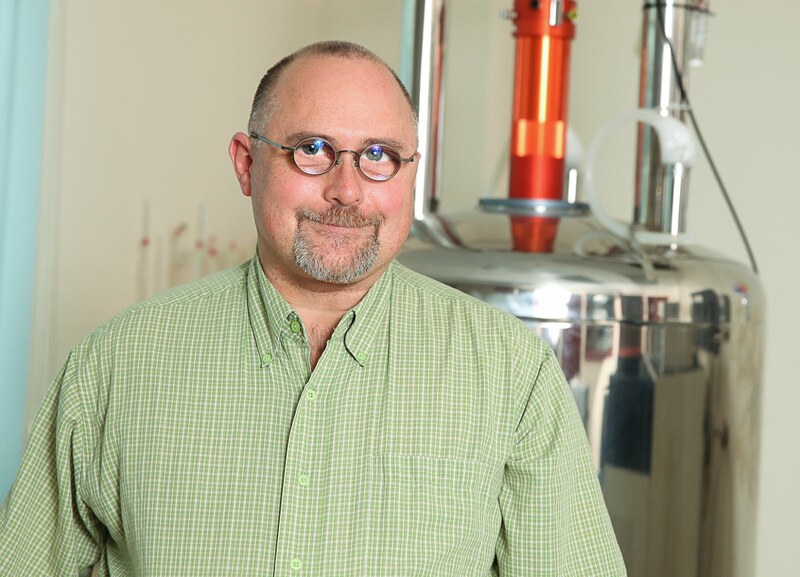 You can identify exchangeable protons in your proton NMR spectrum with a very simple technique called a "D2O shake". For some reason this simple technique, used frequently years ago, seems to be used so much less today. All you do is run a 1H NMR spectrum of your sample then put a single drop of D2O in the tube, shake it, and run another spectrum. The exchangeable protons will exchange with the deuterium in the D2O and disappear from the spectrum. The D2O does not have to be miscible with the solvent. 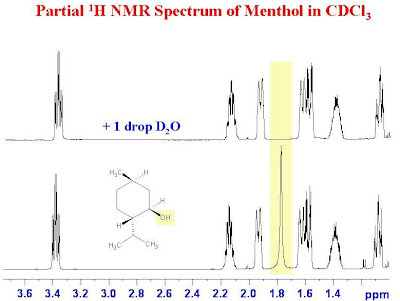 Below is a partial proton spectrum of menthol in CDCl3. The bottom trace is the spectrum before the addition of D2O and the top trace after 1 drop of D2O was shaken with the sample. The -OH peak has clearly disappeared. Wow my book makes it sound more complicated than it really is. Good explanation. Thanks! This is very clear for exgeable protons. But how to identify protons involved in intra-molecular H-bonds, like in 2-acetylphenol??? these protons wouldn't be exchangeable: their chemical shift is not altered by the concentration modification and the D2O shake test inefficient. Despite the intramolecular hydrogen bonding in 2-acetylphenol, I would be surprised if the phenolic proton would not exchange with D2O albeit at a slower rate than comparable phenolic protons in the absence of hydrogen bonding. These types of protons can usually be identified by their characteristically high chemical shift values. The acidic protons (-OH, COOH)after being exchanged, where it will appear in the NMR Spectra in different deuterated solvents such as CDCl3, DMSO-D6 and mixture of DMSO-D6+D2O (two different water residual signals) ????? The residual -COOH or -OH protons after addition of D2O to the sample often undergo fast exchange with any water protons present in the sample. The single resonance as a result of fast exchange is between the water resonance and the -COOH or -OH resonance. Its precise position depends on the relative amounts of water and -COOH or -OH. For example, in the case of CDCl3 where residual water appears at ~1.6 ppm and -COOH at ~13 ppm, the exchange peak could appear anywhere between 1.6 ppm and 13 ppm depending on the relative amounts of water and -COOH in the sample. Why this method is not frequently used these days? That is a good question. I guess many users do not want to get their samples wet as it makes them more difficult to recover or perhaps they do not want to deuterate the exchangeable protons. Many people identify exchangeable protons by running a 1H-13C HSQC.